I don’t know who I am. I’m alive though. I’m really old, I think. Sometimes I think I recognize the people in this family. There’s a woman and a man, he’s not that great but she seems more familiar, she reminds me of something. They answer, “Come on, Gran, stop asking that!” But if I stop asking, there’ll be no me anymore. I’m lost, I can’t find my history anywhere. I get on with the cat. He sits on my tired old legs and has a good knead. I think he’s a tom cat. He brings me out of my torpor. I hardly ever know how to say the words that I’m thinking, and the images just disappear. I don’t know what these people are called. There’s a boy. He’s nice, he makes me happy. He sits at the kitchen table, and drinks his milk, dipping brown biscuits in it. The smell takes me somewhere, but I can’t remember where. All smells do that. I’d love to remember, but I just sit in silence with no images and no memory. A journey – gripping and good – that’s how I’d describe this book. Le Parole Scappate – 32 pages of essential, easy-read text plus eloquent, dark images of two people often surrounded by sea, with fish swimming through it like the words swimming through their consciousness – is definitely gripping. In it’s simplicity and directness, it holds you, it churns your stomach, it upsets you, it absorbs you and in the end, it changes you. It also makes you smile, because poignant and melancholic as it is, it also has flashes of lightness and joy. It’s a human story, it’s a delicate and not sad portrayal of human experience. It throws you gently and respectfully into two cases of human difficulty: two people alienated from their lives because one – a young boy – has trouble deciphering words, the other – his grandmother – has trouble remembering them. Words escape both of them, the little boy because he has trouble holding them steady on the page, and the grandmother because her memories have run away from her and she can’t keep hold of what’s going on around her anymore. Without a way to keep hold of words – past and present – both stumble to find themselves. 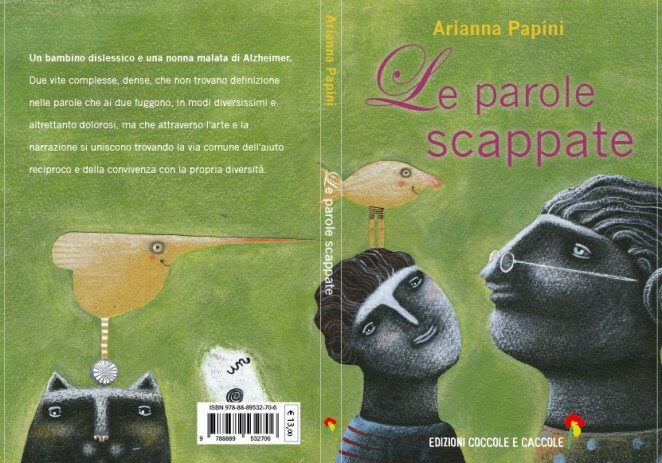 Le Parole Scappate does what books are supposed to do, especially children’s books in translation to boot, and in the very best and straightforward of ways. For twenty minutes, you go on a journey into the experiences and feelings of two people who, without books like these, we might go through life not understanding and not appreciating how unusual and difficult their existence can be. By giving us the two separate voices, Arianna Papini helps us to understand what it’s like to have Alzheimer’s or Dyslexia, but even more importantly still, by putting the two characters in the same situations, in the same house, in the same kitchen, at the same drawing table, through her touching portrayal of the relationship between the boy and his grandmother, we emerge wiser, more insightful, more hopeful and not sad from this story. When I have my afternoon snack, I sit next to my gran in the kitchen. I feel safe with her. I can see she doesn’t know who I am, she can’t remember anything anymore. Gran made the coffee every morning. No one saw my sign. It was the sound of my heart booming when everyone would shout out answers to the game “What word is it?” and I just moved my lips in silence. Sofia was the only one who noticed, and she told her mum who told my mum. Life isn’t any better since everyone found out that words fly away from me. What I mean is, in some respects it’s better because the teachers don’t stress me as much, but I feel sad because I don’t think anyone believes I’ll ever learn. Mum and Dad would get angry with her, but I knew that she’d seen it. My eyes can’t keep up, I only see parts of the words. To me they all look alone, by themselves, in the middle of lots of other words which zoom in and out of focus, like in a camera lens. Sometimes I think that gran and I have a lot in common. What a pair. I don’t know why, though, but it makes me feel better too. Mum and dad were both really good at school and I’m just a disappointment. It makes me feel worse for them than for me, which makes me angry, with them first and then with myself, because words jump around before my eyes and in my head. Gran forgets I’m her grandson and she never knows my name, but I can see she loves me the way I am. Mariadele doesn’t know what to call the boy and she doesn’t know who he is. She does know, though, that spending time with him makes her feel good, perhaps reminding her of feelings which, like fossils, are buried somewhere unreachable within her, never to be cancelled but which she is no longer able to express in words. The boy wants to be with her too, because even though he knows she’s not well, he feels safe with her, safe in the knowledge that the many questions they have in their heads when they spend time together are much more important than any answers – confused and disconnected – that they would never be able to put into words. This is a book for everyone. Children and adults. We all stand to gain something from it.. it’s way more than just an interesting twenty minutes over morning coffee. It helps you to reflect, it helps you to explain, to yourself and to children, how grandparents might change, but they still have feelings, and can express their love and emotions, through simple gestures like a hand on a chair, a caress of the hand, a sketch on paper. It explains how a happy-go-lucky child, full of the joys of life, may have a head full of ideas and stories to tell, but when he tries to express them, the words get all tangled and trip him up. Arianna Papini takes her readers on journeys. Last time it was to a better understanding of friendship. This time, in her highly successful and recently reprinted book, Le Parole Scappate, she takes us to a different place. A place in which different people, of different ages, different backgrounds and with different problems come together. And in the ensuing encounters, we learn how mutually helpful and reassuring these meetings can be. For them. And for us.